We enjoy taking day trips down to Philly several times every year. 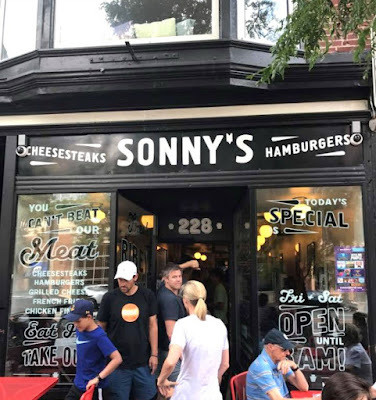 Every time we're down in the city, we like to stop in to Sonny's Famous Cheesesteaks + Burgers in Old City, Philadelphia, Pennsylvania. 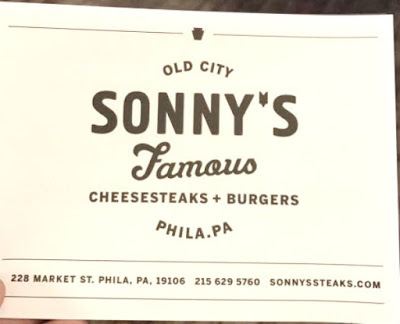 If you've never had a burger or cheesesteak from Sonny's...you're really missing out! They're some of the best in the entire city! You'll find Sonny's Famous Cheesesteaks + Burgers located on 228 Market Street in Philadelphia, Pennsylvania. Just plug that into your GPS and you'll find them with no problems at all. They are located within a few blocks (walking distance) from the Liberty Bell. Sonny's makes some of the best and authentic Philly cheesesteaks in the entire city. Matter of fact, they won many foodie awards for them. They're open 7 days a week and open year round. Hours are 11am to 10pm Sunday's through Thursday's and on Friday & Saturday's they're open from 11am to 3am to accommodate those late-night munchies! The menu is online and you can view it on their website. You'll find mouth-watering Philly cheesesteaks, a wide variety of delicious burgers, hot grilled cheese sandwiches, French fries, onion rings, chicken fingers, mozzarella sticks, soft drinks, bottled water and more. If you plan on visiting Independence Hall, the Liberty Bell or even the Independence Visitor's Center, you'll find Sonny's Famous Cheesesteaks just a few short blocks away. A great place to stop in for a hot lunch, dinner or late-night snack while visiting the downtown Philadelphia attractions.